Justin Crepp, Freimann Assistant Professor of physics at the University of Notre Dame, provided the high-contrast imaging observations that confirmed the first extrasolar planet discovered in a quadruple star system. He is a co-author on a paper about the discovery, “Planet Hunters: A Transiting Circumbinary Planet in a Quadruple Star System,” recently posted to the open-access arXiv.org, and submitted for publication to The Astrophysical Journal. 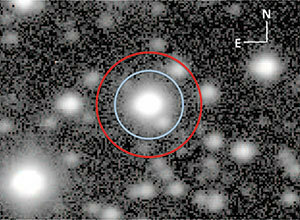 Crepp’s images revealed that the system involved two sets of binary stars. The planet was first noticed by volunteer citizen scientists studying publicly available Kepler data as part of the Planet Hunters citizen science project. Crepp says human observers sometimes are more likely than computer algorithms to recognize planets orbiting binary stars because the complex systems do not produce periodic fluctuations like planets orbiting a single star. “We can’t see the planet directly, but Kepler can see unambiguous indications that it exists,” he says. One of the stars in the binary system is slightly more massive than the sun, one slightly less. They orbit each other once every 20 days, and the planet orbits them once every 137 days. Crepp’s high-contrast image, taken with a telescope in Hawaii, showed a second binary star nearby. Crepp’s research focuses on imaging extrasolar planets, with the ultimate goal of finding an Earth-like planet in the habitable zone around a star. Such planets are 10 billion times fainter than stars, while Jupiter-like planets are one million times fainter. Crepp also works on creating improved instruments for such research, including one in process for the Large Binocular Telescope (LBT) in Arizona. Crepp’s work would provide precision infrared Doppler shift measurements to the LBT, an international consortium in which Notre Dame is a partner. Originally published by Gene Stowe and Marissa Gebhard at newsinfo.nd.edu on October 29, 2012.